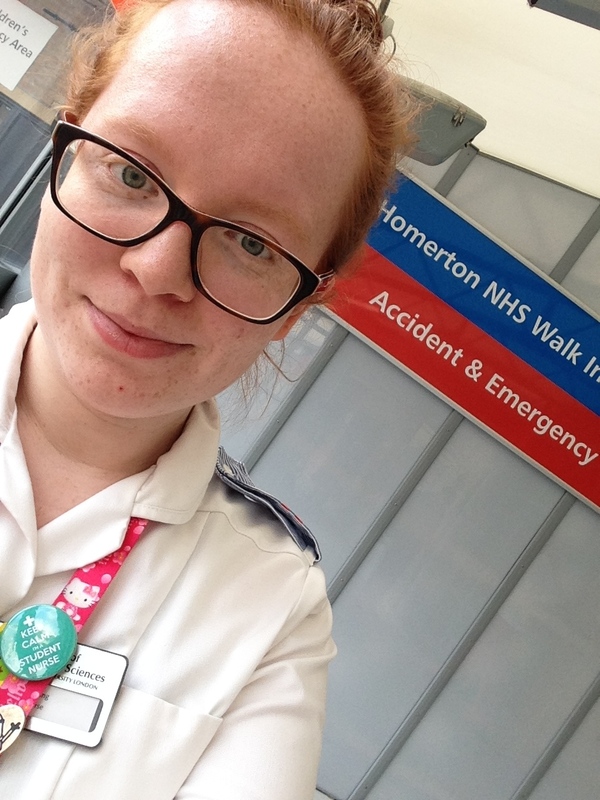 Child Nursing student, Alex, describes her experience on placement at Homerton Hospital. Hi! My name is Alex Spedding and I am a third year student nurse studying BSc (Hons) Child Nursing. Last year I did a high dependency placement at Homerton CEA (Children’s Accident and Emergency Department). Before starting this placement, I was worried about what to expect from such a busy environment and the types of conditions/scenarios I would come across, but as soon as I arrived my mind was put at ease by the friendly and reassuring staff. Everyone from my mentors, other members of the nursing staff and the doctors were all so welcoming, inclusive and willing to answer any questions no matter how silly I might thought they were! My favourite thing about the CEA is that no two days are ever the same due to the constant flow of patients with different presenting conditions. The department is split up into three areas of care: assessment, cubicles and resus so as a student you get to experience different aspects of emergency care. I have really enjoyed being allowed to work independently, doing my own triage and assessments of patients who present to the department and decide what course of action to take eg. Refer to be seen by an A&E Dr, a paediatrician (if child under 1) or to the primary urgent care centre (PUCC) to be seen by the hospital’s on-call GP’s. These decisions are all made under the supervision of the nurse in charge of the CEA, so I am able to hand over my patient’s presenting symptoms, discuss any concerns and if needed, the nurse will review at the patient. The assessment and triage of patients involves taking details of the presenting complaint, any previous medical history/allergies, medication given, social history and carrying out basic observations such as heart rate, respiratory rate and oxygen saturations. The patients all need to be weighed so any medication can be prescribed if necessary. Some of the conditions I have been able to assess include pyrexia (high temperatures), UTI (urinary tract infection), febrile convulsions (seizures), viral induced wheeze (difficulty in breathing), overdose/self harm, croup (barking cough) and various types of injuries. Working in the cubicles in CEA has also helped me work independently using my own initiative, as I need to prioritise the patient’s who need more urgent care. The patient’s who are placed in these cubicles are usually too unwell to be in the main waiting area e.g. Requiring oxygen, having difficulty in breathing so need inhalers/nebulisers (medication to open the airways to make it easier to breathe) or have contagious symptoms e.g. rashes. The cubicles are also where the Dr’s do their assessments so may require nursing assistance with any procedures. I have been involved in various procedures at this stage such as Nasogastric (NG) tube insertion (a tube inserted through the nose into the stomach for feeding/medicines), wound care and dressing, assisting in cannulation/blood taking, ECG recording, assisting in lumbar punctures (a sample of cerebral spinal fluid taken from the spine by a needle) and providing distraction for the children when they are having other procedures done (usually by singing and dancing to ‘Frozen’!). Getting to experience the resuscitation (resus) bay of the CEA has been by far the most scary but exciting part of my placement! The department usually gets informed of a ‘paediatric blue call’ that is due to arrive and the resus bay will be on standby with a nurse, doctors, consultants and other members of the team depending on the severity of the child’s condition. The conditions I have seen in resus include intubation (a breathing tube inserted into the child’s oesophagus to help them breathe as they can no longer do it for themselves), non-responsive episodes and difficulty in breathing. As a student, I made myself as available as possible to assist and learn as much as I can. In these situations it is very fast paced and there are high amounts of pressure to stabilise the child quickly, however, the staff have all been amazing, inclusive and try to talk to you as they go along to explain what they are doing and why. In resus, I have been able to administer medications via different routes under supervision, calculate IV (intravenous) medication infusions, practice clinical skills such as NG tube insertion and record basic observations (heart rate, respiratory rate, oxygen saturation levels) and neurological (brain/movement) observations at fast intervals. I have also been lucky enough to be involved in a CATS (children’s acute transport service) transfer and was able to observe procedures such as central line insertion (a long, thin tube inserted into the chest/arm so medication, fluids and nutrients can be given quickly), catheterisation (a tube which allows the child to go to the toilet when asleep) and the complex work that goes into getting a critically unwell child ready for transport. I have also been able to support the parents during this anxious time whilst their child is being cared for, and I have done this by constantly communicating with them and reassuring them every step of the way. What I like best about the placement’s City offers is the variety of clinical areas/settings you get to experience as a student. The placements I have been on and the opportunities I have been given so far have been completely different, which has helped develop my nursing skills and made me a more confident person. . I also like City’s placement co-ordinators try their best to allocate you a placement that is near to where you live – I currently travel around 30 minutes to placement on the bus (which is pretty good, especially after a 12 hour shift!). I generally work 3-4 days a week in CEA and as a second year, I work a variety of long days and nights to mirror my mentor’s rota so I can work with them as much as possible. The best part of being a student nurse for me is constantly learning new things and being given a challenge – which this placement has certainly given me! But I have always gone in with enthusiasm and tried to get the most out of it. I have been very lucky to have such supportive and friendly staff to work with who have really pushed me to get the most out of this placement. I also have thoroughly enjoyed working with children/parents from a wide range of backgrounds/cultures and situations and now feel more confident in my communication and nursing skills as a result.